Meet the Friendly Faces of the Cambridge Companion to the Literature of New York! 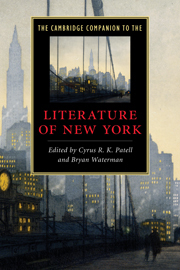 On the eve of the publication of Cambridge’s latest addition to our Companion series – The CC to the Literature of New York – Editors Cyrus Patell and Bryan Waterman have started featuring profiles of their talented contributors. Tom is Associate Professor of English at New York University. He received his doctorate in the History of American Civilization in 1996 from Harvard University. He also holds a masters in History from Harvard (1992) and did his undergraduate work at Yale, where he majored in Literature and History. He is the author of The Clerk’s Tale: Young Men and Moral Life in Nineteenth-Century America, which was a finalist for the Modern Language Association’s Prize for a First Book. The originality of the book arises from its treatment of the figure of the “clerk” as the focal point for an interdisciplinary history of U.S. antebellum literary culture. Tom uses unpublished manuscript sources — primarily young men’s diaries and letters — to recover a world of marginal and ephemeral literary production, thereby revealing the emergence of a new gender- and class-based sub-group of literate culture, a group with a distinct and sometimes abrasive relation to the higher literary culture emanating from the more elite schools and universities. Tom shows how these young men use reading and writing as the tools of self-making, not in order to achieve the kind of abstract “self-reliance” that Ralph Waldo Emerson extols in the first half of his career, but rather to find their way into the networks of commerce and social life that marked the antebellum U.S.
Robin is a cultural historian who focuses on U.S. performance and theater, race, gender, sexuality, and childhood during the nineteenth and early twentieth centuries. She holds a doctorate in American Studies from Yale and is currently Assistant Professor of Women, Gender, and Sexuality and of History and Literature. Her most recent publication is Cast Out: Queer Lives in Theater , which includes memoirs and interviews by Edward Albee, Cherry Jones, Peggy Shaw, Craig Lucas, George C. Wolfe, and others. She is also the editor of Generation Q and the author of a children’s book titled Terrible, Terrible! Check out their excerpts and read more at A History of New York. . .